We’d love your help. 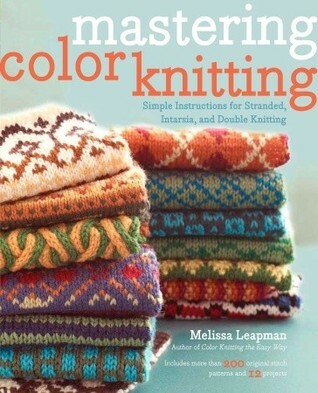 Let us know what’s wrong with this preview of Mastering Color Knitting by Melissa Leapman. Conquer classic stranded knitting, One of the reasons knitting and colorwork master Melissa Leapman first learned to knit was her wish to make one special project—a sweater using Fair Isle technique. Now, for the first time, she brings her passion for advanced color knitting to knitters who want to knit with any and every color of yarn they can wrap around their needles. To ask other readers questions about Mastering Color Knitting, please sign up. This is a good book on colorwork for beginning or intermediate knitters who want to try or are not very familiar with colorwork. It has techniques, some cool tips and tricks as well, as a good primer on color theory. The book is divided into three sections and covers stranded colorwork, intarsia and double knitting, with four projects for each technique. Patterns range from home accessories like pillows to sweaters, hats and scarves. While I think the projects would be good for practicing the te This is a good book on colorwork for beginning or intermediate knitters who want to try or are not very familiar with colorwork. It has techniques, some cool tips and tricks as well, as a good primer on color theory. The book is divided into three sections and covers stranded colorwork, intarsia and double knitting, with four projects for each technique. Patterns range from home accessories like pillows to sweaters, hats and scarves. While I think the projects would be good for practicing the techniques, I was not in love with man of them, though there were a couple of hats and a scarf I liked. so if i was stranded on a desert island with needles, some yarn, and this book... yeah i'd be pretty screwed. it's not a bad book by any means, and i'm going to make sure i keep it handy for reference tips and tricks. maybe they're useful. but if i didn't have access to youtube or other knitters to explain things to me when they don't make sense, this book would have just left me more confused than i was starting out. i'm not exactly an advanced knitter or anything but i'm learning as i go, and i so if i was stranded on a desert island with needles, some yarn, and this book... yeah i'd be pretty screwed. but if i didn't have access to youtube or other knitters to explain things to me when they don't make sense, this book would have just left me more confused than i was starting out. i'm not exactly an advanced knitter or anything but i'm learning as i go, and i feel like the things i understood are now more intricate than they were in my own head, which is amusing as the author keeps reminding you just how simple everything is. i kinda wanted to punch her in the face after the 5th time she pointed out something was easy. even reading is difficult for someone who has no experience with it and continually telling them it's easy when you just have a lot of experience is really friggin' condescending and patronizing. This book has the best explanation of color theory that I've ever read. While I was in school, we didn't ever learn anything about art in my Parochial school. I was too busy being "academic" to learn fun things that might have interested me. These explanations fill in the holes in my education. Excellent overview of color knitting techniques, although as usual the project ideas are somewhat underwhelming. However, I may now be brave enough to try steeking; if this book can accomplish that, certainly the attitude therein is contagiously can-do! Imagine this book is best for the intermediate/experienced knitter. Includes well-curated libraries of patterns for stranded, intarsia and double-knitting. Great patterns with clear instructions and useful tips. Real simple instructions and a great all around book to add to your knitting library. For an advanced beginner like me the book contained enough to cover all my color knitting desires. I did't read everything in detail but got an overall impression of all the techniques possible - I will read them when I need it (for example the chapter about intarsia, not so interestet into that at the moment). I liked the pattern 'library' best - used some of the charts for this project. Most of the projects in the book are nice but are explicit and time consuming ones so I wouldn't knit one of t For an advanced beginner like me the book contained enough to cover all my color knitting desires. I did't read everything in detail but got an overall impression of all the techniques possible - I will read them when I need it (for example the chapter about intarsia, not so interestet into that at the moment). Most of the projects in the book are nice but are explicit and time consuming ones so I wouldn't knit one of them (except for the small stuff like the hats). Excellent guide if you are thinking of getting into color knitting. As a fan of double knitting, I really appreciated the amount of information and variety of techniques covered in the double knitting section. Nice, clear illustrations for most of the techniques in the book. Would like to have seen a few more for techniques that were only described in text format but at least the text explanations were nice and clear. A good complement to The Essential Guide to Color Knitting Techniques, which cov Excellent guide if you are thinking of getting into color knitting. As a fan of double knitting, I really appreciated the amount of information and variety of techniques covered in the double knitting section. Complete and clear instructions on what the subtitle says - stranded, intarsia and double knitting. The first chapter does provide a brief overview on color knitting concerns such as choosing colors and dealing with yarn ends, though the proceeding book in the series covers those issues more in depth I'm told. As a knitwear designer and knitting instructor who has studied both knitting and color theory extensively, there were no "ah-ha" moments for me. The presentation of the information was well Complete and clear instructions on what the subtitle says - stranded, intarsia and double knitting. The first chapter does provide a brief overview on color knitting concerns such as choosing colors and dealing with yarn ends, though the proceeding book in the series covers those issues more in depth I'm told. Recommended to S. by: a friend who knits like a pro! This book taught me everything I needed to know to pick up my needles and conquer my fear of Fair Isle and Intarsia both! For years I have been skipping patterns that involved colorwork. I bought this book and read it from cover to cover. Melissa has a wonderful gift for teaching. She made my demons vanish by showing me that my fears were all in my head! Today, I LOOK for colorwork patterns to challenge myself and improve my knitting skills. I cannot wait to read and try another of Melissa's books This book taught me everything I needed to know to pick up my needles and conquer my fear of Fair Isle and Intarsia both! Today, I LOOK for colorwork patterns to challenge myself and improve my knitting skills. I cannot wait to read and try another of Melissa's books! I read this at the library this morning and found it very helpful. I only liked the two hat patterns so I will check it out in the future to try my hand with color knitting. The best part, though, was the explanation of how to read a knitting chart. I realized I had done a pattern in a different book the wrong way! It's no wonder the head band looks different than the picture. The point is that this book seems to explain the three techniques simply, with color-coded illustrations. This is a knitting book I really enjoyed! I came into it as somewhat of a novice, having only ever done stripes before in terms of color knitting, and it was a great guide with lots of pictures and plenty of explanation. Wide variety of awesome patterns for men, women, and kids, along with handy color guides and skill tips. Recommended to anyone tackling color knitting for the first time or refining technique, or that one relative that always asks how you make such cool stuff. This is a well organized and formatted knitting book for the Kindle. The only reason I didn't give it 5 stars is because it's meant more for beginners. It's a great introduction and resource for those tentative about jumping into color knitting. I liked all the extended e-book content available online via hyperlinks such as charts and knitter's graph paper. I loved all the patterns. I just wish the colors would have been included in the keys for the pattern library. There were a few that had combos I would like to use. I'll just have to guess the colors. I'm trying some reversible stuff now and it is hard!! Well, keeping track of it is interesting anyway. I think the book is good for learning techniques, but most of the actual projects I won't want to make. An excellent resource for learning or perfecting knitting with colour. The techniques are explained clearly and this is a go-to resource for me. This book has helped me to perfect my stranded knitting and I will definitely return to this book when I decide to figure out intarsia - one day! A through guide to the basics of several techniques, and good advice for designing your own projects in each. If you're not ready to plunge into designing, there's a small but nicely varied selection of full patterns, and a wider ranging sampling of charts and motifs. What a lovely book! Leapman's passion shines, but there is such a great deal of detail... if only it was spiral bound. This is essential reference for people considering the Master Knitter's program. pretty book, some interesting techniques. I particularly appreciated the steeking info w/multiple copies. didn't really read all of this so it would be nice to come back to. Good reference. Contains color theory, stitch patterns, basic knitting technique and of course special colorwork techniques. I might buy this for myself, certainly a nice gift book. It was a good book for learning about color but I was hoping for more instructions on how to handle multiple color changes in items such as socks where stretch is a concern. This book gave some good insight and great tips, but for a newbie like me it raised some other questions it didn't answer. Good, also has stitch patterns. Goes over the 3 techniques in the title: stranded (fair isle), Intarsia and double knitting. Personal like Color knitting the easy way by Leapman a little more. Really good resource for learners. Has tons of practice patterns. If you are just learning colour work, this book is great at giving you instructions. Most of the descriptions are followed by visuals. Lots of learning projects so you can practice. Plan in borrowing or buying this to practice some color projects. Clear and good.